Crystle is going for a swim. Well, I guess not. The goggles doesn't fit. She's still dreaming about her swimming fantasies. On the day we came back from Malacca, a friend gave us a Christmas cake! I want to stay there too. We ate the cake, tried to bite on the decorations but apparently we couldn't. So, in the end, this is what my mom inspired. From a serious school trophy to a Christmas trophy! P/S: I have a lot to blog about my Malacca trip yet I am lost for words. The post will come soon. How soon? Just SOON. Wait for it ya? Oops, it might be a little too late but it's the heart that counts right??? So, where have I been, you may ask? I've gone to Malacca during Christmas on the 23rd and came back yesterday. Yes, Duyun, I will update about my bored life soon. You want PICAS?? I will give you some. Here's one. Pebbles and Princess wishing you a very Merry Christmas! 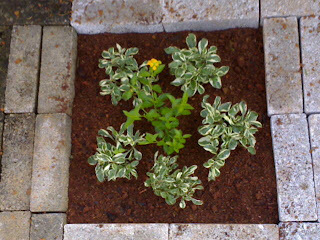 There are beautiful flowers blooming out of the corner of the kitchen cement. That very corner is always wet with soap water and softener. Who could possibly think that these two chemicals become the fertilizers for the lovely flowers! So what is the name of the purple beauties?? 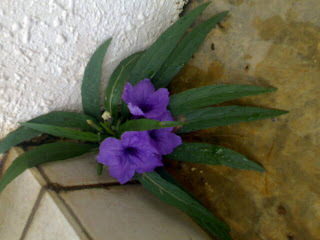 It's RUELLIA. Absolutely beautiful. God is such a great artist, don't you agree? 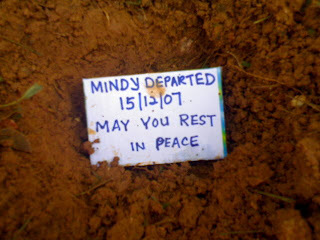 Mindy's funeral took place just now. One of the pioneers of the Terrapin Kingdom had left the loved ones behind her. This great member of the family that we are talking about here is Mindy. With a personality so strong, she persevered throughout her feeble and weak life. No matter how many times she was on the verge of dying, she would always pull herself back together and keep on striving to live. Mindy gets a royal funeral because she is truly one in a million. She deserved it. I told you. 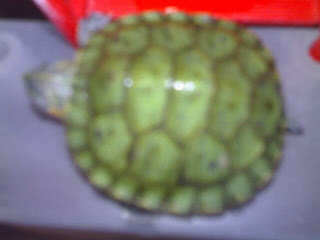 It's the Dying Season for the terrapins. Can you believe it that their chance to survive now is quite low? In this Dying Season, none are safe. One of my mom's favourite has joined the rest of her heavenly friends this morning. Her name is Mindy. She had been my mom's companion for almost a year. Two weeks after she was brought home, she had a fell and twisted her neck. Ever since then, she had difficulty in eating and moving about. However, my mom still loved her albeit her imperfection. This morning, I received a message from my mom, carrying a very grave news. 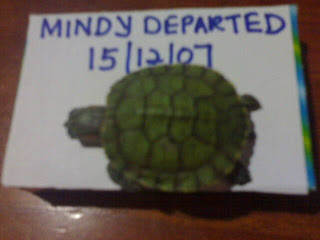 Mindy had returned home to be with the Lord for eternity. She died beautifully with a straight neck and it was no longer crooked like it used to be. It was raining the morning she died. Even the sky was crying in sorrow. I recalled it was also raining after we buried Saffy. When I reminisced about Saffy, my heart feels heavy. I guess I know how my mom is feeling right now. She was so tiny and light yet she had a strong will power to live on. May you rest in peace, Mindy. Movies are getting dull as I watch them. The euphoria I was anticipating after exam is just not here. Life is getting bored like it used to be two years ago. That is the reason why I have been drowning myself into more and more work (not in the sense of house chores though). The work I am currently working on is a cross stitch project delayed since I received it as my birthday gift. There's also a 1000-piece puzzle which I am figuring out the easy way out to fix it. 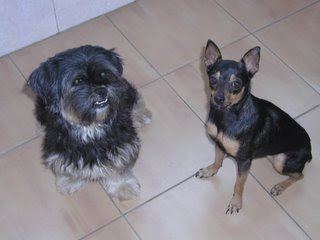 I just received a message from my mom saying that Fitry just died. The cause of death is also unknown like Nana's. Something fishy is going on. Terrapins die easily this season. It's about time a forensic squad be established to investigate these mysterious yet sudden deaths. Oh, by the way, turtles are fragile and their deaths will come unannounced. They are now facing a Fungus Crisis. I'm been trying my best to outdo them by using the ultimate weapon I could find. It's a bottle of ANTI-FUNGUS LIQUID! P/S: Fitry's obituary will be up next. It's a sad post and not something that you should look forward to. May Fitry rest in peace.